This was a story that was a bit of an experiment and was a challenge for both me and artist Cory Thomas (Go read Watch Your Head!) If you can’t tell already (and if you can’t then you must be brand, brand new to the strip–hey, welcome! ), I kind of like dialogue. But part of what makes the origin stories so fun for me is getting the chance to try some new things. I sensed some impatience with the three pages of silent action that led to this page, but I like how they give a lot of weight to what you see above. But that’s me. We’ve seen Zurida before. Here and here. Full name: Zurida, Mistress of Worlds. Best not forget that when addressing her directly. Behind her back, feel free to call her Cupcake. I do. 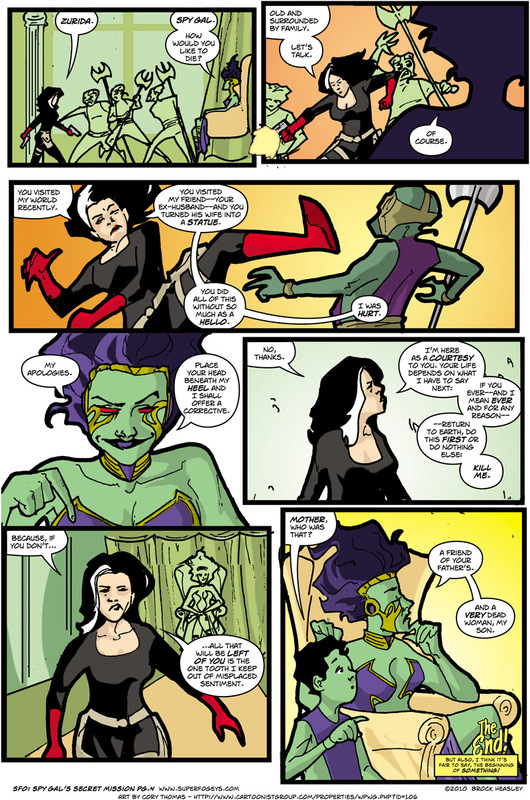 DID YOU MISS YESTERDAY’S MONDAY SUPERFOGEYS UPDATE? Well then, click right here. See you on Thursday with SuperFogeys 270!